Check out this Beautiful 2008 Mercedes C300. This car looks and feels practically brand-new! This 2008 Mercedes-Benz C300 comes fully equipped with: Power seats, doors and 4 one-touch windows. Multi-functional remote, keyless entry. Cruise Control. Navigation. Ice Cold A/C. Tilt &Telescopic steering wheel. Steering Wheel mounted controls. In-dash AM/FM/CD/MP3/Bluetooth Player. Multi-function LCD display. Power Sunroof. Dual Front Active Headrest Restraints. Lumbar support.The Mercedes-Benz was fully redesigned for the 2008 C-Class: The wheelbase has been stretched slightly, improving interior space, especially in the rear seat. The C-Class interior also benefits from new features, including a very impressive optional hard-drive-based navigation and surround-sound audio system, along with a much-improved version of the COMAND interface. With its mix of driving involvement, comfort and high-tech goodies, the 2008 C-Class is a great choice for a luxury sedan. The paint is beautiful and this car is clean inside and out! Come take a look in person! Call to make an appointment for a test drive, today! 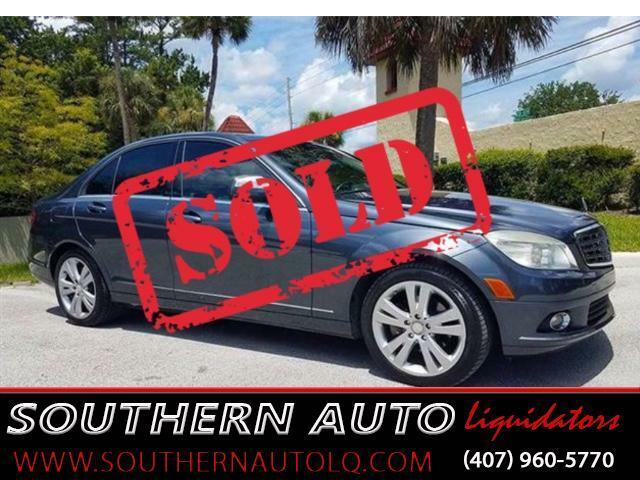 Southern Auto Liquidators 1255 Belle Ave. Unit 131 Winter Springs, FL 32708 Phone: 407-960-5770 Get a well-maintained, competitively-priced, Used Car in Winter Springs at Southern Auto Liquidators. We hand select our Used Vehicle Inventory, to offer unsurpassed quality and value. GIVE US A CALL TODAY FOR YOUR PERSONAL APPOINTMENT... 407-960-5770. ***You will never pay dealer fees at Southern Auto Liquidators. *** We believe in giving you the highest quality vehicle for the lowest possible price. Give us a call or text, and we will be happy to calculate your total out-the-door cost. We Accept VISA, MasterCard, CASH, Debit Card . NEED FINANCING, WE CAN HELP, FINANCING IS AVAILABLE... GREAT RATES!!! We can also work with your bank or credit union, please visit your bank or credit union for financing information if you prefer to go through them.